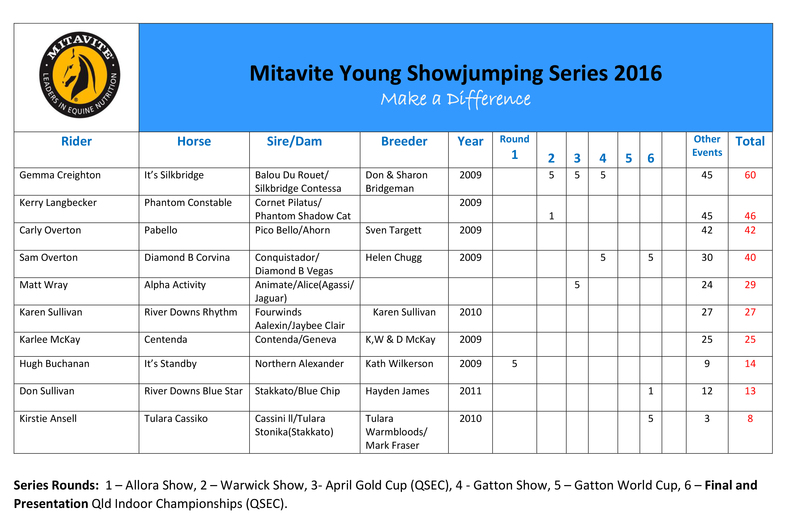 The Mitavite Young Showjumping Series is designed to promote the development of young showjumping horses aged 4 to 6 years. Points are accumulated for the Leaderboard by jumping double clean rounds in Mitavite classes and in any official showjumping event (minimum height of 1.05m) throughout the duration of the Series. 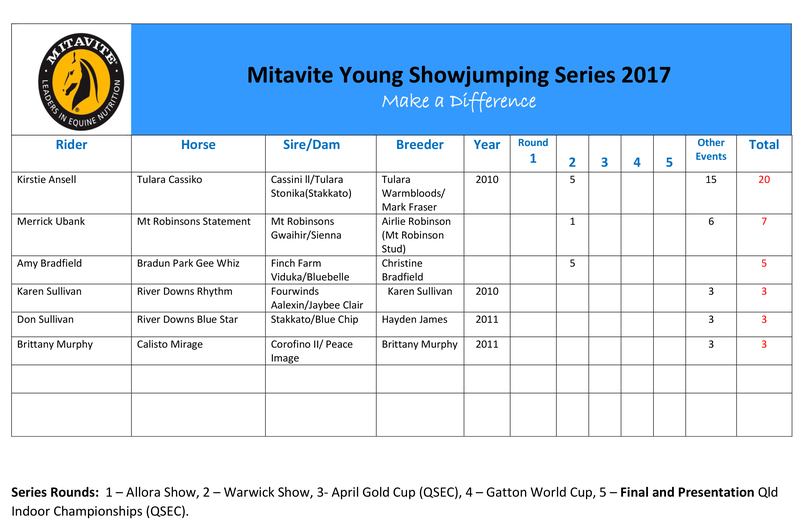 Mitavite recognises that breeding is a valuable aspect of showjumping in Australia therefore this Series will be an opportunity to showcase competition bloodlines for riders, breeders and spectators alike. Horses must be 4 to 6 years of age to be eligible (horses born 2010–2012). Classes are run under Article 238 1.1 unless the class is being run in conjunction with another event. In either case double clean rounds will share the prize pool. Rounds will be advised and held at shows throughout the season, these may be subject to change. A Mitavite Young Horse Performance Record must be purchased for a fee of $10. The Performance Record is provided to keep track of the horse’s points for double and single clean rounds in the Series and for official classes where they jump double clean. Mitavite Performance Records may be purchased at Series events or via the email below. In Series classes, horses receive 5 points for jumping a double clean round and 1 point for a single clean round, points will be displayed on the Series Leaderboard. Young horses collect 3 points for jumping double clean rounds in any official event outside of the specified rounds for the Series. It is the rider’s responsibility to have the judge sign their Young Horse Record to honour these points. Young Horse Records may be copied and emailed in order to update the Leaderboard when requested. The horse keeps a continuous point score regardless of a change of rider. 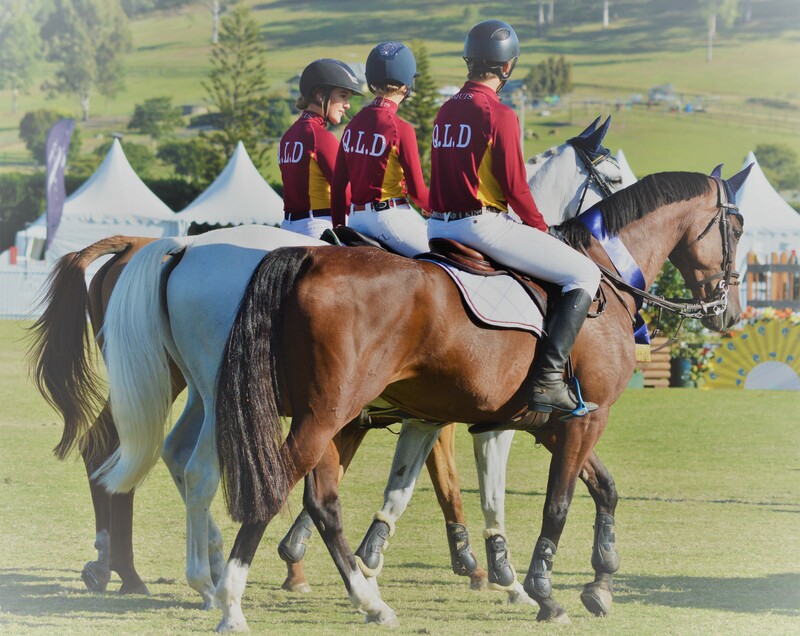 Riders must provide their horses EA Registration Number, date of birth, bloodlines and name of the breeder where possible, to be displayed on the Leaderboard. The horse at the top of the Leaderboard at the end of the Series will be awarded the winner, runner up will also be awarded. The Breeder of the winning horse will be recognised with a trophy from Mitavite. A Mitavite Rug, garland, prizemoney and feed vouchers will also be awarded.